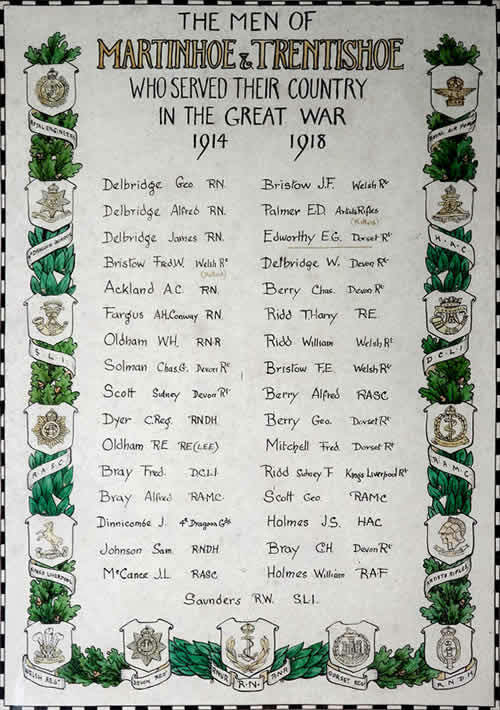 A Roll of Honour is usually a list of name of the men who served in the war and returned - those who died are generally honoured separately. But in the tiny parish of Trentishoe which is linked to the equally small parish of Martinhoe, they may not have had the resources to carry out such a plan in the lean years after the Great War. 5166 Private Frederick William Bristow of the 2nd Battalion, the Welsh Regiment. Son of Mary Ann and the late Richard Bristow. Born in Martinhoe in 1870. Died 18 July 1916 aged 46. 760955 Lance Corporal Edward Ducarel Palmer of the 1st/28th Battalion, the London Regiment (The Artist's Rifles). Son of Sir Frederick and Lady Palmer of Newland House, Coleford and The Barton, Martinhoe. Probably born in Belgium - though his birth was registered in Monmouth in the December Quarter of 1897. Died 30 October 1917 aged 20. The underlining on the Roll of Honour was previously believed to relate to E. G. Edworthy. Our thanks are due to Mavis Cherrill who has proved conclusively that the word "died" which has been added in pencil relates instead to the Edward Palmer mentioned just above the Edworthy name.